In olden days Ammi kuzhavi was a mainstay in every home to grind the spices.which is used for grinding masalas and chutneys gives you awesome taste especially for fish curry ,by stone grind chilli paste.Now we become lazy and mainly we feel it as time consuming to grind in stone.Fish Curry can be made by any variety of fish you like ,Preparation method is same to follow. Cumin seeds 1/2 tsp grind by sprinkling water in to smooth paste. 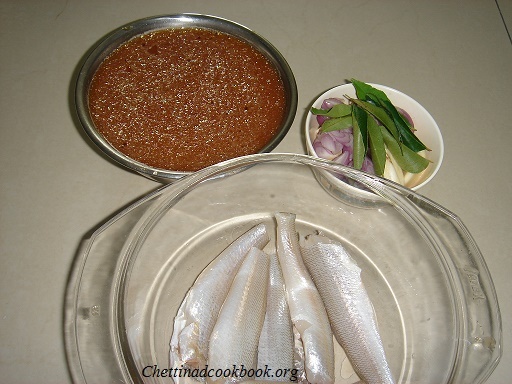 Add this stone ground paste in tamarind water to prepare fish curry, you will enjoy the delicious taste of grandmothers fish curry. Tamarind juice-1 lemon sized tamarind soaked in warm water and extract the juice. Crushed pepper-1/2 tsp or ginger can be used in the place of pepper as you prefer. Peel and cut Shallots andGarlic in to big pieces,Chopp Tomato,slit green chillies keep ready. Take a bowl add 3 cups of water, add tamarind juice ,chilli powder,Coriander powder Salt and Turmeric powder mix all well and keep aside. Clean fish with few drops of lemon and 3 pinches of salt, wash off and keep ready for cooking. Heat pan with oil season with above mentioned ingredients. Add cut garlic, onion, curry leaves and Green chillies saute until golden brown. Add chopped Tomatoes mix well till it leaves its skin,add crushed pepper in it. Now add prepared gravy in step-2 allow it to boil for 5 to 10 minutes when it starts becoming thick add fish . 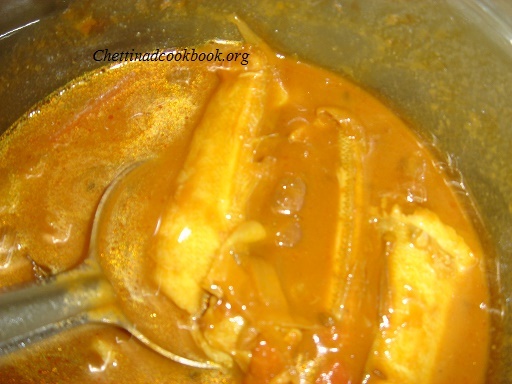 Simmer and cook ,It takes few minutes for the fish to get cooked,Check consistency,it leaves oil on top of the curry.Leave it in the same kadai do not keep closed for sometime. 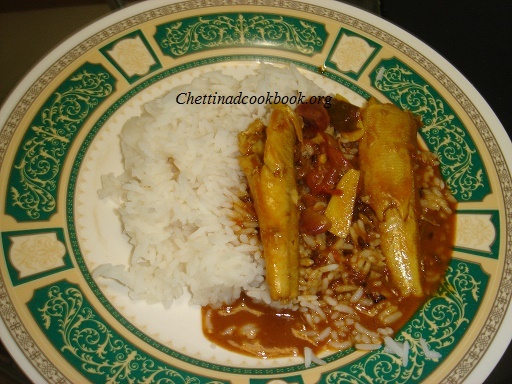 Serve with hot steamed rice.Fish curry tastes great on the next day.